You know Trump has planned for this. There are several points where the Dems could attack, and they’ve already tried fruitlessly attacking most of them. Dems have already plastered egg all over their faces with the Russia Collusion thing* and now they’re about to do the same with taxes. Because they’re that stupid. * Of which they were absolutely positively certain he was guilty and deserving of impeachment. BUt just when exactly, will all this supposed ‘egg on their faces’ have ACTUAL Meaning?? Are any gonna go to jail?? Will this put them all in the no longer being voted back into office camp?? This newest demand from Democrats again demonstrates that they do not plan to do ANY legislative work in this (or next Congress. I say fire every one of them for failure to do their jobs! We pay their salaries – we should be able to fire them! Demanding the tax returns is a folly for which the Democrats will pay dearly in the next election. Congress, fix immigration and the economy. Stop wasting your (our) time with trips down Alice’s rabbit hole……. Are ALL Democrats on dope? I want MORE than just them being fired. Toss them in a jail cell, and throw the key away! This is only a good thing if the outgoing obstructionist Dems are replaced by real Republicans, as opposed to obstructionist RINO’s. The incoming Republicans need to get serious about passing real conservative legislation, especially in support of Trump’s agenda, since he’s apparently the only one with a clear conservative agenda to speak of. Stop worrying about if the Dems respect you in the morning. They won’t. Stop worrying about if the FNN Media will report favorably on your pro-American efforts. They won’t. Just resign yourself to the fact that they will hate you, tell lies about you, and try to derail your efforts at every opportunity. Because they’re evil. So stop trying to be chummy with pure evil that will never be chummy with you in return. I’d like to see the tax records of the Democrat and Republican politicians AND their family members and friends. For it is there that we’ll find the massive corruption that Congress is so concerned about. AND add in every dem lobbiest! Mr. Trump should not disclose his tax returns. 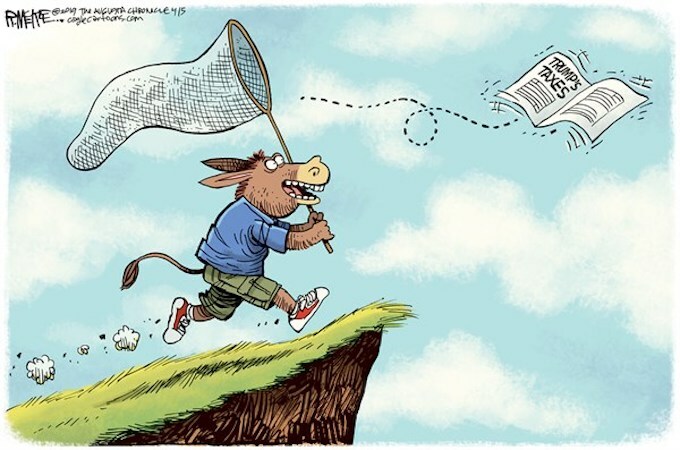 And the Dems are up the creek with out a paddle as no one but the taxpayer has a right to the tax returns. They can not get them unless Mr. Trump gives them. Lets see the tax returns of all the Dem members of House and Senate first. ANYONE who is in congress that doubled their income during their tenure ‘working’ for the people NEEDS, SHOULD, and we DEMAND they be investigated and their tax returns audited to determine WHAT THE FRAUD IS and HOW they became SO wealthy !